Bison is adding 40 new Freightliner Ultralight tractors to our fleet, benefitting both our Drivers and our customers! At Bison Transport we constantly invest in our fleet to ensure that our Drivers and customers have access to the latest in equipment and technology. You may have already read a little bit about how sometimes this dedication earns us special rewards like testing Freightliner’s pre-series Cascadia. While we only received one of those to test – out of 12 in North America, we’re adding 40 new Ultralight Freightliner tractors to our fleet! While it’s a benefit for our Drivers to be equipped with the latest in technology, it’s also a benefit for our customers – and they are a large reason why we’ve added these new Ultralight tractors to our fleet. The tractors are used for single-haul (non-LCV) use and because of their lighter weight, can haul heavier shipments. While this tractor is significantly lighter than our other tractors, Drivers are not losing any of the creature comforts that they are used to. The interior cab is exactly the same as our current Freightliner tractors. Powertrains featuring the lightweight Detroit Diesel 13 litre engine (DD13), mated to the direct-drive Detroit 12 speed automated Transmission (DT12). The DD13 engine’s smart design integrates groundbreaking, fuel-efficient technologies to produce maximum horsepower and torque at low rpm. a lightweight aluminum 5th wheel. All of the new features are definitely making a difference to our fleet! 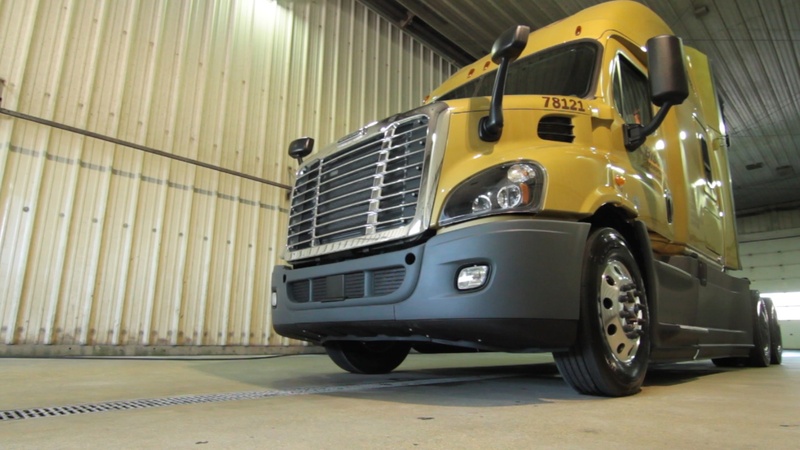 We’ve already received some of the new Freightliners, and we can tell you that we’re seeing approximately 8 MPG (miles per gallon) at a pre-break-in stage of around 6,000 miles. Drivers report that when fully fuelled and including a Driver, the units weight in at just over 19,000 lbs. – you can even see us do a scale test in the equipment tour video. We’re always excited to bring new equipment into our fleet and be able to offer solutions that benefit both our Drivers and our customers. Look for the new Ultralight Freightliner trucks on the road!